As you all probably know by now, I’ve been having some trouble with pain and weakness in my hands, which I assumed to be a worsening of my Carpal Tunnel. The aching has reduced how much time I can spend at the computer each day (more than a little inconvenient for a writer), and the weakness has caused my usual clumsiness to level up (spill half a pot of pasta in the sink: check; dump a scalding cup of tea down my chest: double check; slice my finger open when I lost control of a knife: also check). But Carpal Tunnel is manageable with rest, and I expected the doctor to tell me to take a few weeks off from typing, and I’d be good as new. Here’s where the plot twist comes in: It’s not Carpal Tunnel. We’re not sure what it is just yet, (although it looks like we’ve ruled out Rheumatoid Arthritis – yay! ), and it seems we won’t find out for a while as I’m waiting on a test that’s currently scheduled for early August, with a follow-up to discuss the results in September (boo!). So…unless this condition decides to go away as mysteriously as it developed, I’m basically looking at not having full use of my hands for at least the next three months. I’ve already had to make a bunch of changes in my personal life: how I hold pots and cups and plates (without using my thumbs), teaching my kids to do more things for themselves, abandoning pretty much all of my hobbies, and spending less time on the computer. But it looks like it might be time to make a few changes professionally now, too. For the next few months, I’m going to cut back on the frequency of my posts here. I’ll still post my reading updates at the end of each month, but consider any other posts over the summer as bonuses. I’m also going to stop posting on my author Facebook page – this was a hard decision to make, but since I’m not doing any crafts right now (pretty much the only thing I post over there) and the algorithms mean only a small fraction of my followers even see my posts, it seems to be a wasted platform for me right now. However, since photography is (pretty much the only) one of my hobbies I can do with limited hand strain, I’ve now joined Instagram. You can follow me at k_callard. So far it’s mostly pictures of my fluffy Muppet dog, since I’m still learning the ropes over there, but hopefully I’ll find my groove soon. You can also still follow me on Twitter. And maybe one day you’ll see me over on change.org trying to get signatures in favour of changing the phrase “all thumbs” to describe someone clumsy, to “no thumbs” instead. Seriously, though, I’m kind of looking forward to a summer off work, adventuring with my family and dreaming up new plots to write once I get my hands back. Hope you all have a great summer! I’m going to keep this week’s post short and sweet, but I wanted to announce that as of this week I’m officially one of two new Ottawa Area Coordinators for the Canada East chapter of the Society for Children’s Book Writers and Illustrators (aka SCBWI). It is a volunteer position that will involve organizing meet-ups several times a year and coordinating critique groups. My Co-Coordinator and I are still settling in, but I’m already looking forward to planning our first meet-up (hopefully in September). I’m fortunate to have so many talented authors and illustrators living in my city, and I’m excited to be a part of bringing us all together. 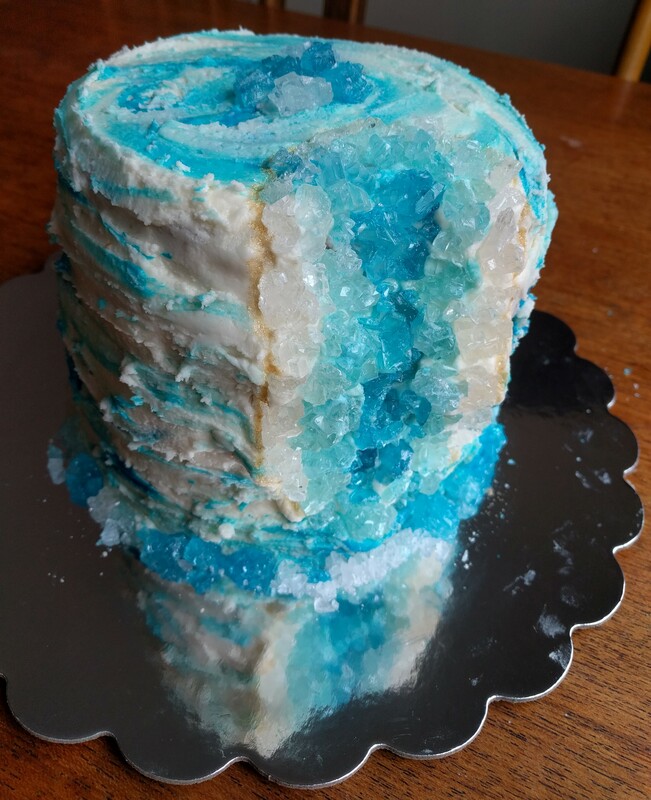 Sorry, everyone, but I used up all my hand strength making this (fondant-free) geode cake for my daughter’s birthday. Hope to have an update for you all next week.